Tired of your kids always asking for money? Aggravated when they just buy whatever's popular without any regard for price? Frustrated they never save or share any of the money they get? Wish you could help your kids become more responsible with their money? You can. All it takes is a little Allowance Magic. This step-by-step program gives you the tools you need to teach your kids about money and money management as you help them develop the habits of saving and sharing. At the same time, those frequent requests for money, and the occasional arguments they can lead to, are gone forever. With Allowance Magic, you develop a structure within which your kids make most of their own day-to-day financial decisions. That way, they learn to plan their expenditures and shop for value. They also get in the habit of saving and sharing a portion of everything they get. So, what are you waiting for? 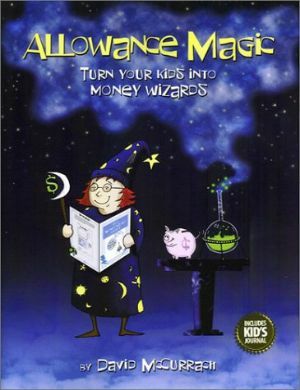 Start making your own Allowance Magic today and watch your kids become Money Wizards! Why wait? Order Allowance Magic now! You have your own objectives and challenges. These pages present the information you need to make the most of them. © Copyright 2004 by David McCurrach. All rights reserved. Revised 4/25/04.